Running in parallel with each edition of the Cannes Film Festival are several sidebars, including one named Cannes Classics. The titles shown are significant in some way to the history of cinema and quite often premiered in Cannes. This year everything from a 4K restoration of Billy Wilder’s “The Apartment” to Yasujiro Ozu’s 1953 film “Tokyo Story” could be found screening in Cannes Classics. 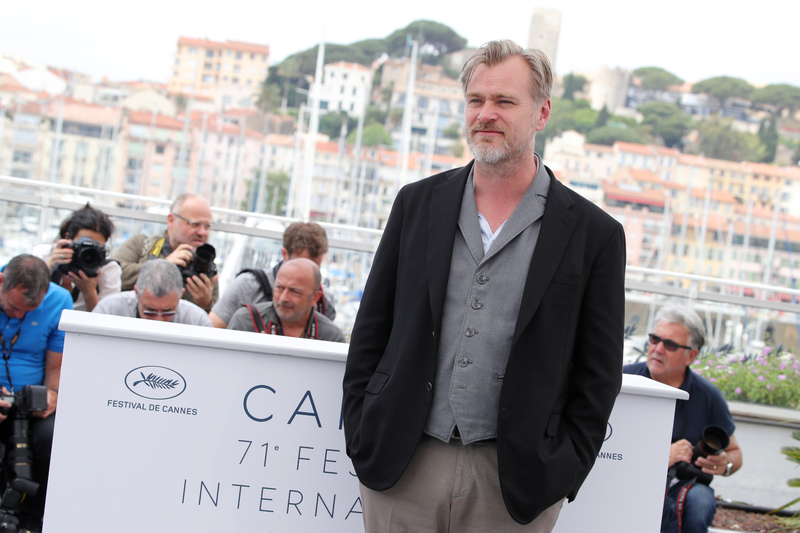 Timed to the 50th anniversary of “2001,” Nolan brought an “unrestored” 70mm print of the film to be shown at the Théâtre Claude Debussy in the Palais des Festivals. The venue is one of the few theatres the filmmaker claims can play the six-channel audio track properly (five speakers behind the screen and a mono surround). When the event was first announced in March, it instantly became one of the hottest tickets at this year’s festival. Indeed, hundreds of attendees lined up for hours in the hot sun to assure they would not be shut out of the Sunday evening screening. Those lucky enough to get in were greeted first by Thierry Frémaux, the director of the Cannes Film Festival, who explained that for this showing of “2001” they actually had to find an experienced projectionist, for this wasn’t a typical screening where someone simply pressed play on a computer. He also told us that the souvenir booklets distributed as we entered the theatre were exact replica’s of the programme handed out at the film’s premiere back in 1968. This fit Nolan’s plan perfectly, for it was his goal to show “2001” in a way that most closely represented what the film would have looked like when it first appeared in cinemas. As Nolan explained in a packed masterclass the day before the screening, this meant using a photochemical process to piece together a new “unrestored” print from various elements. (We’ll let him explain what that means in just a moment.) It also meant that “2001″ was shown with its original overture and an intermission. When the lights finally came up at the end of the movie, the 1,200 lucky audience members headed off in their separate directions, debating the quality of the print; the audio seemed clipped and muffled, the image not nearly as vibrant as many had hoped for and there were moments where the print looked ragged with rips, tears and hairs. 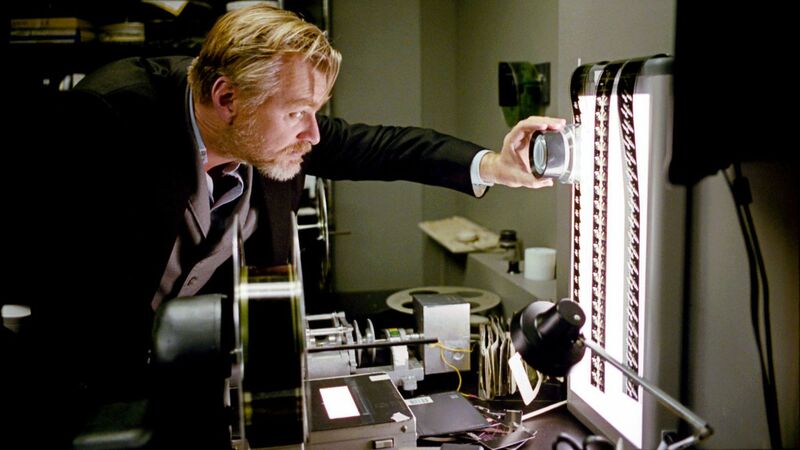 Though if his comments during the masterclass are any indication, Nolan overlooks such flaws, provided he is viewing them on celluloid, rather than digitally. Below is an excerpt from Nolan’s Cannes masterclass in which he discusses this latest version of “2001,” why the movie is important to him, and why he chooses to work on film. The questions (in bold) were asked by the French critic and historian Philippe Rouyer. 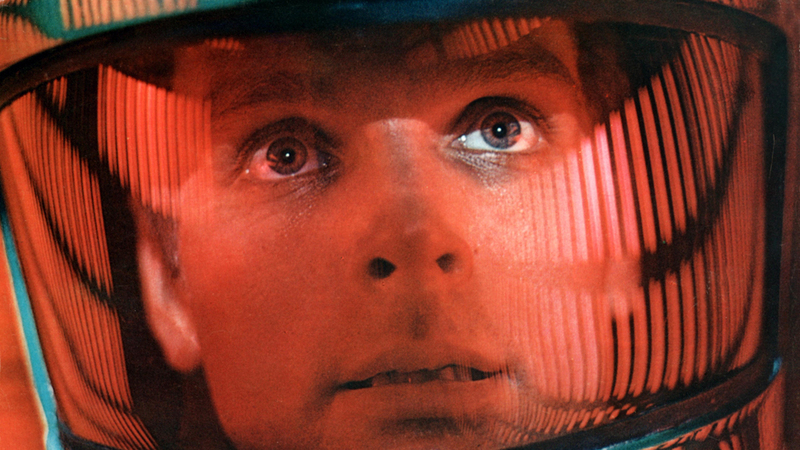 When did you first see “2001” and what was your impression of it at the time? The first time I saw “2001″ was when I was seven years old. It was the year after George Lucas’s “Star Wars” had come out and in the wake of the phenomenal success of that film, “2001″ was rereleased. My dad took me to see it in the biggest theater in London, the Leicester Square theater, which had 70 millimeter projection and I had this extraordinary experience, that I’ve carried with me ever since, of just being transported in a way that I hadn’t realized was possible. The screen just opened up and I went on this incredible journey. I’m very excited to be at Cannes. I’ve never been to Cannes before. It’s very exciting to be here and very exciting to be trying to give a new generation of film goers a the same experience I had of sitting there in awe of [Stanley] Kubrick’s masterpiece on 70 millimeter film. Was seeing “2001” that first time part of what influenced you to make your own movies? I think what I’ve carried with me about, about that experience as far as my own films go is really just a sense that films can be anything. They can do anything. What Kubrick did in, in 1968 is he simply refused to acknowledge that there were any rules that he had to play by in terms of narrative and if there was any such rule book, he threw it out the window and went his own way. And I think any filmmaker being inspired by that, as so many filmmakers have been, they carry with them this idea that movies can do anything and therefore it’s incumbent on us as filmmakers to try and push whatever boundaries we can and not be beholden to a theoretical rule set. And what circumstances do you find yourself to participate in the restoration of the 70mm? Last summer after I finished “Dunkirk,” we went into the lab with the Warner’s guys to transfer seven of my films onto new home video format, 4K UHD with HDR, and the way we developed to do that because it’s a new format and filmmakers hadn’t really used it much, so we were sort of breaking new ground and what we did is we installed a film projectors in the room, so we had a 70mm projector with a 35mm projector that we would project the reels and then project, the 4K material and compare the two. At some point in that process Ned Price who works for Warner Bros. said to me, oh, I have a couple of reels of an answer print of “2001,” would you like to take a look? And myself and my DP [director of photography] when I go, of course, and we will put it up without sound. Just looking at the image, look at the picture. It was astounding. And Ned and I got to talking about how it was the 50th anniversary, or the next year it would be, and the idea came and what could we take the printing elements that were made a back in the 90s, it was an inter positive that was made, could we make a new negative from that and produce 70mm prints that would give an audience the feeling of the way in which the film was originally presented in 1968. That’s what we’ve done. Warner Bros. in, in North America, they had secured almost all of the 70mm projectors still in existence for “Dunkirk,” for our release of that film, and so kind of the planets aligned, I suppose it’s an apt metaphor for “2001,” the planets aligned and we had the projectors, we had a way to make the prints and so we’re, we’re putting it back out there and I think Cannes, as the place to first give people that experience, it’s just a wonderful opportunity and we’re all very excited about it. Whenever you are asked whether this is a restoration of “2001” you dance around the subject and say that it isn’t a true restoration. Why is that? Well really the reason I had been referring to this version of the film as the unrestored version is restoration in the last 20 years or so has come to be synonymous with digitization. And the chief reason for digitizing of films is to clean up the analog anomalies, the scratches the dirt, and then re-output them. But the problem is you lose an enormous amount of information, you change medium in a sense when you do that. And so we looked at the original negative, we looked at what could be done from it and it looked fantastic. And so what we were able to do is go back to the original timing lights, from the lab notes and just try to reproduce as accurately, accurately as possible the photochemical process that would have been done in 1968. Similarly, with the sound, we went back to the six tracks sound, with the five speakers behind the screen and mono-surround, and we’ve reproduced that with no interpretation just as closely as possible to how those prints have been a back then. And digitalizations are a valuable tool for restoration, but we sort of want to bring to light the fact that it is a different medium and films that were made and are being made in an analog way, aught to be presented in an analog way as far as possible. And you shoot your movies in 70mm now which is part of this contemporary American filmmaker club that includes Quentin Tarantino and Paul Thomas Anderson all of whom are shooting and screening their films in 70mm. Why did you get involved in this fight for shooting and projecting in 70mm? Was it to save the format? I think the, the biggest change in this struggle and it’s not really necessarily about 70 millimeter, which is a large format gauge, it’s also about 35mm, 16mm, it’s about film in general. The big change over the last couple of years has been that it’s no longer presented as a combative struggle. It’s no longer, you know, film versus digital or analog versus digital. It’s thankfully and increasing acceptance that they’re different mediums. So filmmakers who want to shoot digitally should have that right. But filmmakers who want to shoot on film should be granted that, right as well. And we need to maintain that infrastructure and make sure that that happens. In the world of restoration, in the world of archiving, it’s increasingly important to dismantle some of the thinking that emerged over the last couple of decades, which is that if archives digitized their materials, that would then replace the photochemical originals, which no archivist really believes, but for years they could only really get funding to digitize their archives. What’s very important is that we recognize that whilst digital is a fantastic tool for access, for getting access to the history of film, for getting archival materials out there, there has to be a photochemical backbone for the management and updating and storage of photochemical film assets. We need that as an industry. We need it for the history of film and we needed for the future of film because film is the only stable archiving medium that that exists. So you’re saying that it’s important that creatives have the choice between digital and film. You’re clearly on the side of film. Why, for you, is film a superior medium to work in? I mean, over the years and in defending my way of working, you know, there are different ways of looking at it. I mean you can talk about the technical side, which is with analog color. You have an infinite number of color gradations as opposed to digital, which is very limited in that regard. You have higher resolution so you can have more detail that’s achievable and so forth, but at the end of the day, it’s really about the feeling and about the emotion that you get. I think as an analog medium film still stands as the best analogy for the way the eye sees, the that we’ve invented. So for my purposes, I find it to be the most immersive and the most emotionally involving tool for drawing the audience into a story, particularly when you can maintain analog, right the way through to the way they see the film. And so with “Dunkirk” for example, we had a very wide release, relatively speaking, on 70 millimeter analog film prints, including our IMAX 70mm film prints. We had 138 prints go out. Which for me was a, was a terrific way to see the film. We also had digital versions I was very proud of and we worked very hard on, but I think where you can maintain the original analog beauty of the film the whole way through, I feel the best connection for the audience comes from that medium. You’re talking about the sensory immersion side of the viewer. Is IMAX an even better tool for that? After all, you helped make IMAX a standard for Hollywood blockbusters and you were one of the first directors to shoot such a film on IMAX with “The Dark Knight.” What made you want to integrate IMAX into your work? I had first experienced IMAX film at museums and so I’d seen documentaries done that way, short documentaries about 40 minutes long was the standard program length, in my teens and felt that this was the future of films. It felt like if you could make a Hollywood film in that format, you would have an incredible tool for drawing the audience into a story because of the size of the screen, the way it can practically fill the peripheral vision, the clarity of the image is quite incredible. So it was something I’d wanted to do for a long time. When we made Batman Begins, I was able to meet the IMAX guys and get into conversation with them about transferring that film, because they’d started to transfer Hollywood movies onto IMAX film so they could be shown on their screens. So we did that with “Batman Begins” and that was the beginning of a relationship that’s been going ever since. With “The Dark Knight,” I went down to IMAX and spoke to them about using their cameras. They’d never been used on a Hollywood film before and what we decided to do was consider certain sections of the film. So the introduction of the Joker and the robbery in the beginning, for example, or the chase where the truck flips over, these kinds of things, we’d say, okay, we’ll do that whole section using IMAX cameras. We really enjoyed it. We really felt that the end results were spectacular. IMAX film is actually the same gauge as 70mm film. It’s 65mm, but it’s sideways. So you get a frame that’s three times the size of a regular 70 millimeter film frame, so it’s incredibly high resolution, but you needed a lot of film. The film is very large and so you could only get about 90 seconds of film on a handheld camera or a Steadicam shot. So there’s a lot of planning that had to go in and we needed a lot of cooperation from IMAX in terms of giving us a lot of their cameras so we could load one, shoot with one, and then when that ran out, send that off to be reloaded, pull the other camera in. So there are a lot of complexities to it. We loved it though when we’ve carried on working that way. Over the years we were able to develop new tools with new lenses, faster lenses and so forth. So by the time we got to “Dunkirk” we were actually able to shoot the entire film on large format 70mm and most of it, the vast majority actually, on IMAX film with IMAX cameras. And so those film prints that went out, for me, they represented kind of the culmination of a process or an ambition that I’d had since I was about 16 years old. So I was very, very happy to have finally been able to sort of achieve that. What’s interesting is that you’re not only choosing to shoot in IMAX and in 70mm but also trying to avoid using digital techniques for other aspects of your films such as effects and green screen. This is very unique for blockbusters these days. Does this change the way you work, especially with your actors? Those things are all tied together in the sense of if you’re working in an analog medium, you become very aware when you digitize and your record out, your negative and you compare, you can see the subtle variations, you know, you’re always losing something when you digitize. And so we tend to approach our filmmaking, myself and my team, we tend to approach our filmmaking from an analog point of view and say, in a pre-digital world, how would we have dealt with this situation? How would we have hidden these wires? Or would we’ve built the set, built the top of the set. When we came to do “Dunkirk” in our desire and our struggle to maintain the original camera negative and not have to digitize, we wound up doing things like we constructed these fences of cutouts of men, and we would have two extras dressed as soldiers carrying 10 other extras who were painted and they will be far down the beach and we would dress them to camera and they would be quite convincing. Similarly, we had certain boats and certain trucks that were done as paintings and put in the background. These were techniques we had learned from art directors that we had worked with in our early days who had worked on much older films. So we went to these art directors and said, what would you have done before you could just digitally sort of fix it up? A lot of those techniques are cheaper than the digital techniques and they’re more effective and they allow you to maintain your original negative. So once you’re thinking like that, I think it translates into your whole creative process and the process you create with your actors and you start naturally providing them with things. In the case of “Dunkirk,” I talk about that film because it’s my most recent. It’s the freshest in my memory, but you know, we’re on a real boat with real planes flying over Mark Rylance’s head and he’s watching this really go on. So there’s a level of immersion for the actors that allows them to apply their gifts, not to creating a convincing idea of the reality around them, the physical reality, they get to just react to that. And then their process and their gifts can be applied to another level that you’re looking for from an actor’s performance, which is to look into the deeper meanings of the story and the layers of human behavior. So for that reason, this analog approach I feel in my process it creates a closer bond between the actor’s process and my process and we’re more together in what we’re trying to do.